The County of Los Angeles has been working on a plan to guide how unincorporated areas and smaller cities in the county should address green space, food access, transportation, biodiversity, and infrastructure in the face of climate change. This plan will also inform how the County uses its resources to further these sustainability goals and strategies. This is a monumental effort in a county as large as Los Angeles, which is why we need you to come out and share your concerns, thoughts, and dreams for your community, so that South LA is heard in this plan. 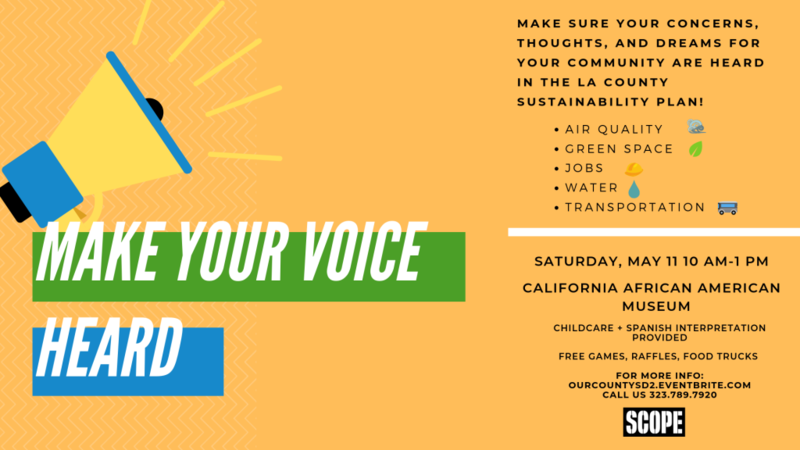 Make sure your vision is reflected in the LA County Sustainability Plan by joining us on Saturday, May 11 at the California African American Museum! Childcare and Spanish interpretation will be provided. Additionally, there will be raffles, games, tree giveaways, energy cost savings clinics, and food trucks at this free, family friendly event. To RSVP, click here or give us a call at 323-789-7920.